penelope bly | If we want creative, innovative, thinking children, we need to dare to disagree for true education reform. If we want creative, innovative, thinking children, we need to dare to disagree for true education reform. Montclair School Board’s 2013 strategic plan is hyper-focused on undefined ideas of effectiveness, achievement, rigor and expectation. As a result, goals and objectives are vague, confusing, arbitrary, sometimes meaningless. The students’ needs are ignored. And, expectations are unfairly set higher for at-risk and non-proficient kids. I mentioned in a previous post that I have experience as a program evaluator. The word “effectiveness” is written on my eyelids in Sharpie. Having said that, I’m sick of hearing it. It’s one of the most overused and misused catchphrases of the decade, along with its sister phrases, evidence-based and data-driven. Montclair’s School Superintendent Penny McCormack waxes passionate about school effectiveness. Yet it means almost nothing the way she uses it. In strategic planning and assessment, effectiveness is simply a judgment of how well goals and objectives are met. There is no such thing as, for instance, an effective teacher. There are methods that teachers can use, and that are effective in certain situations. In other words, effectiveness is never a goal, objective or strategy. When McCormack makes it one, she is saying our schools need to work better so that they can work better. It’s a common mistake people make when creating strategic plans without understanding what they are trying to change, how or why. Broadies and other education reformers do it all the time. Assessment isn’t only standardized testing. It is part of strategic planning and implementation from beginning to end. By far the most important part is assessment of needs. If we don’t understand the needs of our children, teachers, paraprofessionals, parents, school administration and others, school changes are likely to be useless, perhaps harmful. McCormack and her consultants used 100 focus groups (“community forums”) and presumably reviewed data to identify Montclair’s school-related concerns. Among other things, she concluded that too many of our kids are non-proficient readers. Most of us would agree. But identifying the problem tells us nothing about how to tackle it. Why do our non-proficient readers struggle? What do they need to overcome the “why?” How can we give them what they need? Asking these questions seems obvious, and if McCormack and her consultants have done so, that’s great. My trust would increase if they shared a detailed report of the results. I suspect they are skipping it. The proof is in McCormack’s strategic plan. The plan seems based on a vision of what somebody thinks schools should be with little consideration for what ours are. It contains no description of our district’s history, demographics, problems faced, strengths and needs. Leaving all of this out of a strategic plan is like a doctor diagnosing a patient and planning treatment without referring to medical history and symptoms. It’s the first red flag that the plan is based on pre-determined goals, and does not actually make our children’s achievement the focal point. The second red flag is the amount of Broadie language used. It tells me (a) McCormack defers to the Broad Foundation’s concerns; (b) at best, Montclair’s concerns are forced to fit Broadie ones. She is quite wrong. Spirit, heart and compassion are warm, fuzzy and easily translated into clear goals with measurable objectives. Maybe, by spirit, heart and compassion, we mean our children need to care about, and give to the community. Therefore our goal is to foster this. Maybe it would involve getting kids to volunteer more and learn about their community. Then our objectives are to increase student volunteering and knowledge of Montclair history. Maybe, after assessing how best to meet these objectives, we decide to require all high school students to do 50 hours of community service a year, and all 5th graders to learn Montclair history. Voila, strategies for policy and program change. It just requires figuring out what we mean by spirit, heart and compassion. This, in turn, requires McCormack and her consultants to put in the effort, and defer to our vision over the Broadie one. Instead, McCormack is hyper-focused on “effectiveness.” Ironically, after labeling spirit and heart too fuzzy, she doesn’t seem to know what she means by effective. The word appears 20 times in a 23-page document without being defined. As part of reaching the goal of effectiveness, the district will be called effective by 80% of parents. To measure whether 80% of parents say this, a consulting firm will design an effective parent survey. To make sure parents complete the effective survey, the district will come up with an effective way to convince them that their opinions of effectiveness are important. That way, the district can achieve its objective of being called effective by 80% of parents. Because, again, being called effective by 80% of parents brings the district closer to being more effective. I did not make this up or exaggerate, I merely summarized. While other goals are somewhat more concrete, they also tend to ramble vaguely about continuous improvement, rigor, effectiveness and high expectations. It’s another red flag. McCormack and her consultants are following education reform ideas but don’t know how to translate them into action for Montclair schools. Reaching 80% reading proficiency in order to improve school effectiveness? It makes no sense. We are supposed to strengthen our schools to help our children succeed, not vice versa. It’s a great thing to strive for, but why 80%? Why not 70% or 90%? Why by 2015? What if only 60% reach grade level but improvement among struggling readers is significant? The objective assumes all struggling readers struggle at the same level and can reach the same finish line given the same amount of time. McCormack sets unequal expectations of achievement, and this objective is a perfect example. Yes, most children are capable of reading proficiently. But the further behind a child is, the harder they struggle just to keep up and the more they have to work to achieve proficiency. This is especially true if they have a learning disability. McCormack’s expectations are unfairly higher for non-proficient students and those who teach them. They are much lower for proficient readers. Many of the objectives involve obtaining 80% of one thing or another — 80% of teachers will score “effective” on a rubric… 80% of central office staff will meet their goals of effective services…. Clearly someone arbitrarily chose 80%, either because they didn’t know what they wanted to change, or because they were deferring to someone else’s criteria. Many of the changes sound great, like re-introducing a world language program to our elementary schools or expanding small learning communities at the high school. But they aren’t objectives. What are we trying to accomplish with these programs? I’m playing devil’s advocate. If we don’t make our objectives clear, we could go shopping for a Honda minivan and come home with a Ducati motorcycle. I’ve noticed we already have a few Ducatis in the garage. McCormack mentions that the plan is a “living” document that can be reworked at any time. As far as I can tell, there have been no attempts to seriously review and revise. The first anniversary of the plan is a good time for it, so I will list ideas for improvement in Part Two of this post. We parents love the Toast the Teachers fundraisers organized by the Montclair Fund for Educational Excellence, and not just because we get to have a good time. What better way to show appreciation and understanding while raising money to support your work? There’s an elephant in the room, so let’s get it out of the way. We parents complain a lot about unions, tenure and accountability. We’re angry over our inability to get rid of the few teachers who have no business teaching. The influence Adams described can be positive or negative. Be assured, we respect your profession, and the majority of us support your right to unionize. We parents admire the vast majority of you who often seem born to teach. You see more than anyone that all our children have the capacity to achieve. Apart from times when you are negotiating salaries, we never hear you ask for more money. We constantly hear you beg for the resources, training and support you need to help our children succeed. You have tremendous influence, but we don’t believe your work should be judged by student achievement scores. We know there are many factors influencing them, as well as the Marshall Rubric evaluations. Not least is the level of respect and support coming out of 22 Valley Road. We understand teaching is an interaction with our children, who do not walk into your classroom identical in personality, situation and need. We we think it’s crazy to treat them as if they are, and we are grateful you think so, too. In other words, we know you are handed a huge responsibility without much control over the outcome. Research shows time and again, jobs like these are the most stressful to have. Whether or not employees can handle it depends on how well their bosses have their backs. When they don’t, employees are more likely to fail and burnout. I’m not trying to be a downer. It’s just that the climate we parents sense is a pall that didn’t exist two or three years ago. Many of you seem demoralized. We can see it’s due in large part to our school leaders holding you responsible for student success while taking away your authority, resources and support. We also see that you are not just worried about your jobs. You are very worried about the harm to our children. Perhaps this information will raise spirits: Back in April, the American Statistical Association slammed the use of VAM and student test scores in evaluating teachers’ work. They explained how flawed the reasoning and statistical methods behind it are, and the fact that results are constantly misinterpreted and misused. Hopefully school leaders and policymakers will heed the message. The ability to communicate clearly and concisely while managing your emotions, and to listen, empathize, understand what people are saying. Creative, outside of the box thinking and an ability to take on multiple roles. Curiosity that drives you to find answers and brings out the curiosity in others. Strong interpersonal skills — working well in a room full of people, monitoring everything that is happening, focusing on, interacting and influencing different personalities. Re-engineering — recognizing when things aren’t working, quickly changing tack and troubleshooting. Good computer and technology skills. Wall Street firms pay big salaries and bonuses for these skills. On average, a summer intern earns the equivalent of $80,000 a year. That alone is justification for your annual 3% raise. We want to keep you, and you deserve more than what you earn. We know that. It is wrong for our school board members to complain to us parents about how much your salaries cost, insinuating you are selfish and demanding; then neglect to mention they balanced much of the cost by reducing your benefits. It’s like maxing out the credit cards because you’re a shopaholic, then trying to convince your spouse its from buying groceries. This February, board members and McCormack complained about raising the $30-40/hour (if that much) pay of — for instance — those of you working with our autistic kids. Two months later they mentioned in their minutes paying a consultant $2800 for six hours of work — apparently in relation to outsourced autism services. When it comes to the hassle and lack of respect our school leaders constantly give you, most of us are on your side. We will try to have your back because they don’t seem to. And, if you ever doubt it, please be assured. We parents recognize and appreciate your value, as professionals and a major part of our children’s lives. We don’t want to lose you, so please stick around. Let us know what you need from us, and we will help where we can. We want to toast you every day. Hiring a PR consultant might be well-intentioned. But it shows Montclair’s eduction reform board members don’t understand strained community relations. They need to focus on strengthening their parent and teacher partnerships by figuring out where they create discord, then changing their ways. Sometimes I am a bit slow when learning the latest happenings. I just discovered Montclair, NJ’s board of education plans to hire, or has hired, a PR consultant. I’m giving board members benefit of the doubt that one of their PR goals is to improve community relations. If so, I tip my hat to their acknowledgement that existing discord needs to improve. I hate to think it isn’t a goal. Otherwise it would mean their focus is outside the community, not in it. Either way, hiring a PR consultant may be well-intentioned but shows a lack of understanding of why there is discord to begin with. I’m probably stating the obvious: “Public Relations” is a misnomer because it is about improving image, not relationships. With PR, someone doesn’t actually have to nurture a relationship with the people whose opinions he wants to change. He doesn’t even have to talk to them or show his face. He could be a complete jerk, and if the PR is excellent, most people will end up thinking he is the hottest hot-thing in all of hot town. But he’s still a jerk. And as any marketer will say, the people being marketed to are called the target population. If our board’s new PR focuses on the community, board members will be targeting us, not relating. I don’t think this makes our board members insidious. They are Broadies, and in keeping with the Broad Foundation approach to ed reform, they see us as customers. It is perfectly reasonable to market to customers. The problem is that we are partners, not customers. Until board members understand this, their relationship with us will continue to be dysfunctional. Again, I’m probably stating the obvious: Relationships are interactive, mutual, give-and-take, based on humility. Otherwise they’re dead in the water. We all know that guy who has all the answers; blames his problems on others; gets angry when challenged; attacks whomever does the challenging; and never seems to listen to a thing he’s told…. Montclair school board members, please! Don’t be that guy! Partnerships don’t improve by promoting a nifty image. They improve by taking a good look at how you contribute to the discord, then changing yourself. I learned about the school board’s PR consultant while reading a patch.com report of Montclair’s June 2014 school board meeting. Parents and teachers at the meeting expressed tremendous concern and frustration over the lack of resources and support offered at Edgemont School, and the degree to which the students are suffering from it. I have to say, it was brave of the teachers to express their concerns. They have their own strained relations with board members. Despite being invited to share, teachers at previous board meetings were often chastised and blamed every time they put forth a bit of “what doesn’t work” honesty. So there the board members sat, with the concerns of Edgemont teachers and parents respectfully laid on the table. It was a perfect opportunity for them to partake in a bit of collaborative discussion and thoughtful probing. Yet, by all accounts, they seemed more interested in addressing the issue of hiring the PR consultant — more interested in improving their image than strengthening their relationships with the people who cared enough to attend the meeting. I won’t get into the question of how much the PR consultant will cost us, and how that money could alleviate the problems parents and teachers raised that night. I was more struck by something shared at the meeting because it points to a potentially serious problem. Is a big contributor to non-proficiency, illiteracy and higher dropout rates — the problems we are trying so hard to tackle. Leaves our district open to legal action from parents. Shows poor budgeting, since it can easily result in having to place students in specialized schools down the road. A highly trained CST paraprofessional hired by us can work with dozens of students for the cost of sending one student out-of-district. Did any Montclair board members also pick up on this and decide to do something about it immediately? This situation shows why it is so important for all school boards to work in partnership with parents and teachers. When Broadies like ours refuse to do so, they isolate themselves. All they end up knowing are their own interests. All they hear are messages passed down by the Broad Foundation — an organization that proudly isolates itself and lies low as a strategy. Consequently, school board members’ interests and Broad Foundation objectives become the focus. The daily concerns of parents and teachers are not understood. They are creating a “let them eat cake” situation. The kind of problems I described above are endemic, especially in inner city districts, and the Broad Foundation’s educational mission is to tackle them. But the Broadie solutions and approach are so off the mark, the problems have increased in many districts led by them. So, here are alternative solutions for Montclair’s board members to consider: Focus more on how you work with people, not how you appear to them. Take the money set aside for the PR consultant and use it to alleviate some of the problems at Edgemont School. Then, support (not oversee) community education forums, where questions, expert presentations and debate from all sides can take place. Attend the forums as equal participants. Air the forums over public access television. Listen to what is shared and adjust yourselves accordingly. Assessing the work of a school board and superintendent goes far beyond completing a yearly satisfaction survey. 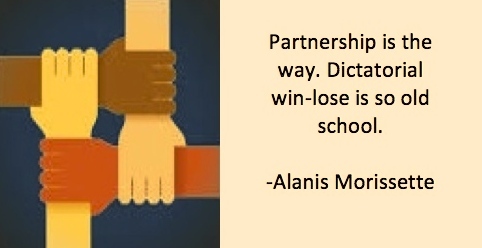 Parents must decide whether board members treat them like partners, and whether the partnership is productive. I love the mission of my town’s Board of Education. Recognizing every child’s ability to achieve and making sure we do right by them… Who wouldn’t want to get behind that? And, as Montclair’s Superintendent Penny McCormack and last year’s Board President Robin Kulwin say, we need to assess to make sure it happens. As the school year ends, our most important assessment is the one we parents do to hold McCormack, Kulwin and other board members accountable for the work they’ve done. We don’t assess them by completing a yearly parent satisfaction survey. That’s how the district assesses itself, and relying on a satisfaction survey means they consider us customers to satisfy. Nor do we assess them only by our children’s test scores. Otherwise, we would also be treating ourselves as customers to be satisfied. We are partners in our children’s education. One of our jobs is to assess whether board members treat us that way, and whether our partnership with them is a healthy one. In Montclair, I’d say the answers are no, and no. This means McCormack, with the backing of board members, is bringing pre-chosen standards, programs, consultants and private curriculum developers into the district. She assures us the standards and programs are data-driven and effective. Yet she doesn’t tell us how they define effectiveness, much less what evidence they have for it. She rarely divulges the names of the programs and consultants, sometimes even when asked. Nevertheless she and the school board expect us to support their changes as good for our children’s wellbeing. Even if we were all staunch Kulwin and McCormack supporters and the board’s strategic plan was the best ever devised, it would be foolish to blindly accept board members’ word. As partners, it’s our responsibility to continually make them answer for every action they take. It’s their responsibility to respectfully do so. I am not challenging anyone to a power play. I am borrowing from the wisdom of Margaret Heffernan, a renowned expert in business leadership and innovation. After decades as an entrepreneur and corporate CEO, she knows that defending ideas and actions is part of successful innovation. Confident leaders welcome it. Heffernan is very clear on this. 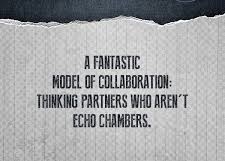 For true creativity, problem solving and change to occur, leaders must have thinking partners who aren’t echo chambers. Based on their actions, our board members do not seem at all confident the community would back them if given an informed choice, and so make it an informal policy to prevent it. Expended considerable resources to pursue, intimidate, harass, blame, belittle and alienate anyone who openly questioned or challenged them. Lied to us by saying they were victims of computer hackers, although they knew staff had accidentally given public access to confidential assessments. Used illegal subpoenas to try seizing email addresses and correspondence of anonymous critics and Montclair residents. Allowed themselves to be dragged into court by the ACLU for civil rights violations, rather than stop the witch-hunt. Still refused to stop after the public learned they had lied about being hacked. Harassed dissenting Board Member David Cummings to such a degree, he was forced to spend thousands of dollars on legal defense. Blamed the legal bills they accrued on Cummings — If “someone” had been willing to give in to their harassment, Kulwin explained, they wouldn’t have been forced to continue harassing him. Ostracized another dissenter among them, Montclair Education Association President Gayl Shepard, by verbally accosting her at a board meeting, then barring her regular involvement. I had high hopes when Kulwin and McCormack first took over. These actions, and others, quickly turned my hopes into disappointment, anger, even disgust at times. I get no pleasure in stating this. Please note that I am expressing serious concerns, not uninformed complaints based on fear of change with a refusal to provide alternative solutions. In addition to being a parent and longtime Montclair resident, I have a lot of experience designing and conducting program assessment and research. As any evaluator knows, poor partner/stakeholder relationships will quickly break a strategic plan no matter how awesome it might be. But what if I were uninformed and afraid of change? If so, information and debate would be more important than ever. When people ask for legitimate explanations, patting them on the head and telling them to be patient is patronizing. Telling them, “I don’t hear you offering alternatives” is a ploy to put them on the defensive and divert attention from the questions raised. Acting wounded and crying “help! attack!” is the same kind of ploy. Incidentally, it tends to backfire. People just see it as disingenuous. Psychological ploys are not the issue per se. The issue, as Margaret Heffernan clearly warns, is that disasters occur when disagreement is stifled by those with power who are capable of affecting thousands of lives. Fear of disagreement makes leaders spiral down, and they can end up sucking a lot of people into their whirlpool. It has already happened a number of times in other districts led by Broadies. Sometimes they have been run out of town after leaving districts in debt and disarray. In Newark, Broadies managed to run through a $100 million donation from Mark Zuckerberg in just a few years. The result: Little positive change, confusion over the money trail, charges of corruption and back room deals, and school reformers running for cover. At this point, it almost doesn’t matter to me whether I agree with our Board of Education’s vision. I respect its members’ experience and commitment, and believe they are sincere in wanting to improve schools. But frankly, they have gone after opposition like they’re hardened criminals in general lockup. That’s not strong leadership. It’s illogical fear of being shanked if they don’t shank first. They have created mistrust, division, legal tangles, unnecessary battles and a host of other problems as a result. Going forward, I hope our new Board President David Deutsch will take what I have laid out to heart. I hope he works to both improve the board’s treatment of parents, and encourage questions and debate. To paraphrase Heffernan, when it comes to transforming our schools, engaging in constructive conflict demonstrates love for our children because it takes love to commit the energy and patience. It also brings out our best thinking. If we want creative, innovative, thinking children, we need to dare to disagree. An End-of-Year Asses… on What’s a Broadie? Montclair School Boa… on What’s a Broadie?